I read this long before but never cared to post it here unless something horrible happened with a very dear friend of mine. We women are vulnerable to road side eve teasing, chain snatching and many more terrible attacks. In a country like ours that does very little for women’s safety, it becomes our own responsibility to safeguard ourselves. Please share it further to spread the word. 2. Learned this from a tourist guide. If a robber asks for your wallet and/or purse, DO NOT HAND IT TO HIM. Toss it away from you…. Chances are that he is more interested in your wallet and/or purse than you, and he will go for the wallet/purse. 4. Women have a tendency to get into their cars after shopping, eating, working, etc., and just sit (doing their checkbook, or making a list, etc. DON’T DO THIS!) The predator will be watching you,and this is the perfect opportunity for him to get in on the passenger side,put a gun to your head, and tell you where to go. If someone is in the car with a gun to your head DO NOT DRIVE OFF, Repeat: DO NOT DRIVE OFF! Instead gun the engine and speed into anything,wrecking the car. Your Air Bag will save you. C.) Look at the car parked on the driver’s side of your vehicle, and the passenger side. If a male is sitting alone in the seat nearest your car, you may want to walk back into the mall, or work,and get a guard/policeman to walk you back out. 7. If the predator has a gun and you are not under his control, ALWAYS RUN! The predator will only hit you(a running target) 4 in 100 times;and even then, it most likely WILL NOT be a vital organ. RUN,Preferably in a zig -zag pattern! 8. As women, we are always trying to be sympathetic: STOP It may get you raped,or killed. Ted Bundy, the serial killer,was a good-looking, well educated man,who ALWAYS played on the sympathies of unsuspecting women. He walked with a cane, or a limp, and often asked ‘for help’ into his vehicle or with his vehicle, which is when he abducted his next victim. ‘Whatever you do,DO NOT open the door..’ The lady then said that it sounded like the baby had crawled near a window,and she was worried that it would crawl to the street and get run over. The policeman said,’We already have a unit on the way, whatever you do,DO NOT open the door.’ He told her that they think a serial killer has a baby’s cry recorded and uses it to coax women out of their homes thinking that someone dropped off a baby.. He said they have not verified it, but have had several calls by women saying that they hear baby’s cries outside their doors when they’re home alone at night. I’d like you to forward this to all the women you know. It may save a life.A candle is not dimmed by lighting another candle.. Send this to any woman you know that may need to be reminded that the world we live in has a lot of crazies in it and it’s better to be safe than sorry.. If you enjoyed this post, please share it using the buttons below. Sharing is good! Great tips, Surabhi. Wonder if the way to creating a world that is safe is possible. We still are one of the few societies that are trusting by default. I hope we will be able to keep it that way. And even I doubt if a completely safe world is possible. After all, nothing is complete! Nice Post Surabhi 🙂 I just now forwarded this to all my friends and colleagues…. thanks a lot surabhi for this post……shall forward to my friends….totally in love with all your posts……too good to relate to and read.thanks again for these women-centric posts.. Thanks for sharing it with friends and thanks for the sweet comment. Please share the blog with your friends. Great post..These are things that everybody forgets.. Thanks dear. Please share it with your friends. I want this word to reach many more women. ANd thanks for writing. My pleasure Angel.. and please go ahead and share it. It will help in spreading the awareness. wow, surabhi, this is a great post…. really informative and interesting… taking on from the above comment, i'd like to share this on facebook too…. Dear Ash.. please share it and spread the word! All the points you have mentioned here are great tips.More so, keeping Pepper spray and knowing a bit of Marshall art must help.Although main thing should be to keep your mind calm even at the face of danger.A composed minds figures out Common sense well enough. Dear Amit, yeah, I also think these are some basic yet very important tips one should keep in mind. And pepper spray is a must. I totally agree with you on both the point that you mentioned. These are some awesome tips. I read it with interest. This is true for everybody and not only for the woman. Yeah, these tips are meant for everyone..
Hey Ghazala.. so nice to see you here dear. I am glad you liked the post. I hope we make use of some the tactics mentioned here.. Thanks Surabhi. But unfortunately, I still don't feel safe. Surabhi thanks for sharing this as we are unaware of some points. And shared with my friends! Thanks for sharing this. I suppose it would be helpful to certain extent. yeah! 🙁 I know these are just precautionary steps.. they dont gaurantee anything..
Hey Shilpa.. thanks for sharing it. You are such a sweetheart! 🙂 stay around. Your tips are really invaluable-they can be very helpful& many are little known too! HI Indu, I am glad you found them useful. 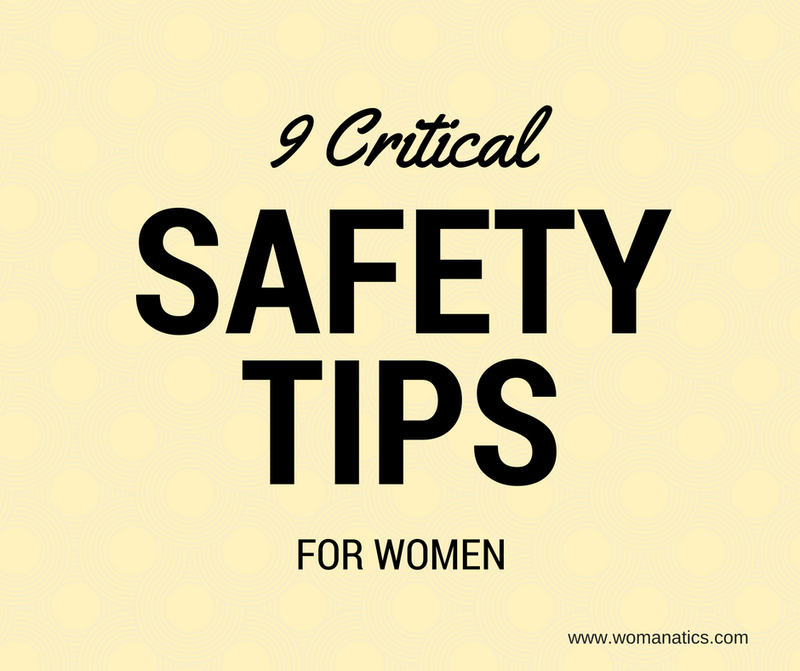 Safety is really important to everyone, but the most priority should be for the ladies. Thanks for sharing valuable tips with us. By hearing all this I really feel ashamed of being a man.. I promise I would do anything to help a woman in need..